Given the terrible weather recently I think we occasionally need a morale boosting story, so here’s three. 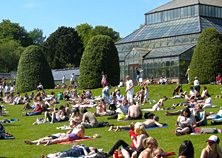 For those that battled through the wind chilled streets of Glasgow to the recent Friends of Glasgow Botanic Gardens talk, Brian Young of Plant Heritage gave a very interesting presentation on the problems, challenges and goals of the Plant Heritage charity. 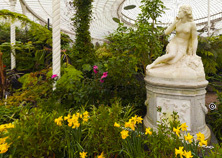 They aim to preserve heritage cultivar lines and promote National Collections within the British Isles and beyond. The charity is preparing to celebrate its 40th anniversary with a re-branding and a move to take their message into schools, allotments and community groups through the plant guardian scheme. 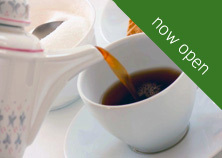 GBG holds three accredited National Collections including Begonias, Arborescent Tree Ferns and Dendrobium orchid hybrids so it was very relevant to work carried out in Glasgow. An interesting talk, well presented. The Glasgow Tree Lovers’ Society have supported the planting of several Araucaria araucana to enhance the Araucaria already growing to the west of the main range at GBG. 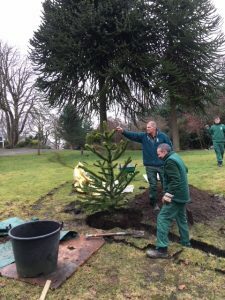 Our aim is to create a grove of Araucaria and, in partnership with the International Conifer Conservation Programme, we hope to plant more wild collected Araucaria in the future. It’s been a real partnership-driven project and we will be installing interpretation panels to enhance the plantings soon. Our wildlife garden, at the top of the herbaceous border, has previously been the focus of work by RSPB, building habitats for solitary bees. University of Glasgow, also working in RSPB/GBG partnership, are leading a house sparrow survey around the west of the Botanic Garden. To support suitable habitat for these birds, RSPB guided some students, completing their John Muir Award, through hedge planting basics. 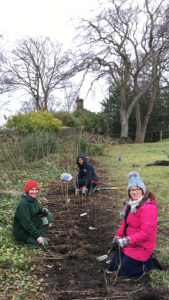 The Friends of Glasgow Botanics matched the RSPB with funds for extra hedging, and a new thirty metre section of native hedging was completed by GBG volunteers. Despite the temperatures and freezing wind, G.C.C. Botanics’ staff and volunteers put the finishing touches to the southerly area of hedging. 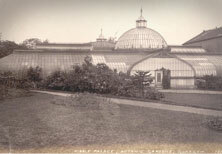 Before the development of the Botanic Gardens site (1841) this area was the site of the Khyber Pass walkway, a track that led from Great Western Road to the River Kelvin, it was an informal hawthorn lined path and the centre of many a disreputable tale. There’s nothing disreputable about our volunteers and the hard work they put in during ground preparation and planting. A job well done.